During Watergate, a significant number of GOP members of Congress and the Nixon administration publicly resisted President Richard Nixon’s efforts to undermine the rule of law. Not the case of today's Republican Party. Republicans in Congress, and even GOP candidates for Congress, have been loathe to criticize the president. Their submissiveness has significant implications. In my view, some Republicans today are, with the support of the president, openly impeding an ongoing investigation that may or many not implicate Trump. Recent attacks from Republicans on Robert Mueller’s investigation into Russian interference in the 2016 election has made that much clear. That’s in contrast to how some prominent members of the GOP acted during the Watergate crisis that led to President Nixon’s resignation. Research in my forthcoming book “They Said No to Nixon” reveals that Republican civil servants serving in President Nixon’s administration blocked his attempts to politicize their work. Their stories, when contrasted with the actions of Republicans today, show how the GOP has transformed from a party that included moderate civil servants to one that embraces a culture of loyalty now. The political backdrop today is of growing crisis for President Trump as Mueller’s investigation has spawned indictments of the president’s associates. Two dozen people, including five in Trump’s circle, have been charged in Mueller’s investigation. On Tuesday, Trump’s former campaign chairman Paul Manafort was convicted of tax evasion and bank fraud on the same day the president’s former personal lawyer Michael Cohen pleaded guilty to eight federal crimes, including campaign finance violations. Trump feeds the crisis atmosphere with intemperate tweets and inflammatory statements. Earlier this month, Trump sent out a tweet that openly encouraged Attorney General Jeff Sessions to end Mueller’s investigation. The president has set the tone for Republicans in Congress who have mostly followed his lead. Rep. Jim Jordan, R-Ohio, has attempted to rally Republicans in Congress to impeach Deputy Attorney General Rod Rosenstein, who is overseeing the Mueller investigation. House Majority Leader Paul Ryan disavowed this effort, though he was still supportive of other measures conservative House members wanted to take that would escalate the conflict with Rosenstein and the Justice Department. The House Republican attacks on Rosenstein follow those of California Rep. Devin Nunes, the chair of the House Intelligence Committee, who has repeatedly tried to find ways to limit the scope of the Mueller investigation. Rep. Jim Jordan, R-Ohio, wants to impeach Deputy Attorney General Rod Rosenstein. Here are three instances when Republicans in both Congress and the Nixon administration stood up to Nixon. One: Richard Nixon resigned from the presidency on Aug. 9, 1974, more than two years after five men who worked for the president’s re-election campaign were caught breaking into the Democratic National Committee at the Watergate office complex. Subsequent investigations uncovered evidence that the White House attempted to cover up their involvement in the break-in in order to hide their broader campaign to spy on their political opponents. That evidence included the “smoking gun” tape which featured the president discussing with his Chief of Staff H.R. Haldeman how they could stop the Watergate investigation. On Aug. 7, Republican Senators Barry Goldwater and Hugh Scott, along with Congressman John Jacob Rhodes, went to the White House and told the president that his support in Congress had collapsed. They also told the president that the House would impeach him and that the Senate would convict him. Nixon announced his resignation the very next day. Two: In contrast to the Republican party of 2018, which has largely followed Trump’s brand of conservatism, the GOP of the Nixon era represented a wider range of views. The Nixon administration and Republicans in Congress included many moderates whose priorities were not always in line with the more conservative White House. Among the moderates were cabinet members Attorney General Elliot Richardson and Treasury Secretary George Shultz. Less than two months before the 1972 presidential election, in which Nixon was running for re-election, IRS Commissioner Johnnie Walters refused to comply with the White House’s plan to audit hundreds of the president’s enemies. Shultz defied the White House and supported Walters, who worked for him. When Nixon later sent orders to the staff of the Office of Management and Budget to punish universities that permitted large antiwar protests, Shultz defied him again and refused to carry out a plan to cut federal funds to MIT. Three: Elliot Richardson, Nixon’s attorney general, famously resigned on Oct. 20, 1973, after refusing Nixon’s order to fire the Watergate Special Prosecutor Archibald Cox. Cox was investigating the Watergate burglary and crimes related to it. In what came to be known as the “Saturday Night Massacre,” Richardson’s deputy, William Ruckelshaus, a fellow moderate, also resigned in protest. Cox was subsequently fired by the man who became acting attorney general, Robert Bork. 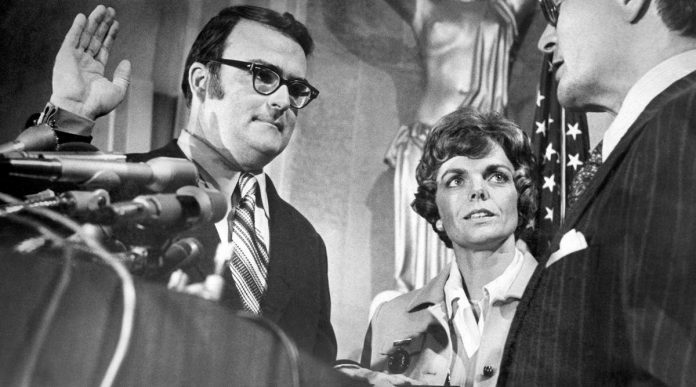 After Cox was fired, Congress was besieged by telegrams calling for Nixon’s impeachment. By the end of the month, a plurality of the American public were in favor of impeachment. Nixon labeled moderates who resisted his orders as weak and disloyal, similar to how Trump has described Attorney General Jeff Sessions and others who disagree with him. I believe that the individuals who said “no” to Nixon placed an emphasis on finding nonpartisan solutions in their work instead of slavishly following their party and its leader. For example, former IRS Commissioner Johnnie Walters, the Republican who refused to audit Nixon’s “enemies,” said in 2008, “By doing the job right, we were protecting our tax system and the tax laws and the taxpayers, and not the Administration.” Like Shultz, Walters’ stand demonstrated that he was someone who was not bound by his political party. Walters and other administration officials were committed to nonpartisan civil service. Nixon was a politician. The actions of Walters, Shultz, Richardson and Ruckelshaus, as well as the Republican congressional leaders who told Nixon he’d lost party support, show that there were GOP officials and leaders who were willing to challenge President Nixon. Similar to today, each of these Republicans had to overcome the president’s culture of loyalty. Nixon frequently obsessed over creating what he called a “new establishment” that would move the country in a more conservative direction. Its central component was loyalty to him. Today’s Republicans are led now by a president who also demands loyalty at every turn. And their actions stand in marked contrast to those who once were faced with similar challenges, and who chose country over loyalty to one man. Michael Koncewicz, Assistant Research Scholar, New York University. This article was originally published on The Conversation.